1 day from 9am to 5pm. In certain situations we are happy to run the course over two evenings but this of course assumes a minimum number of attendees. If this is of particular interest then please do call/email to discuss. At the end of the course there is a short written and practical assessment – see below. The RYA ‘rules’ stipulate a maximum number of attendees of 12 however our courses at our offices rarely run with more than 8 attendees and usually less. Of great value though is that whereas the RYA only ask that we supply one VHF Training set per 3 attendees we own 15 radios meaning that you are far more hands on than you would be with most courses. None! Ahead of the course we will send you a course pack and instructions on what to prepare. This will give you the opportunity to read through our pre course manual and the RYA VHF Handbook. A key area to practice ahead of the course is the phonetic alphabet, this will be detailed in the pre-course pack. Remember to bring a passport photo too. 12 – We are generally happy for a child over 12 to attend a course with their parent/guardian – please call to discuss. Children over 16 can attend on their own but we must have the parent/guardian’s specific permission – please call to discuss. The end of course examination cannot be undertaken by those under 16. What about the end of course assessment? Assessments are scheduled at the end of every course that we conduct in the classroom so you will simply progress during the day towards the assessment. Don’t worry about the word ‘assessment’ – it is not scary! It’s just simply a way of ensuring that you can use the radio, understand what channels to use, make distress, urgency and safety calls etc. There is a short written assessment to complete so if you feel you may have any issues doing this in writing please do let us know ideally ahead of the course as we can conduct this verbally with you. The practical assessment simply involves repeating the various calls you will have made during the day so is best considered as just more practice. One of the changes for 2014 is that the assessment element of the VHF Course will be conducted by a separate RYA Assessor. 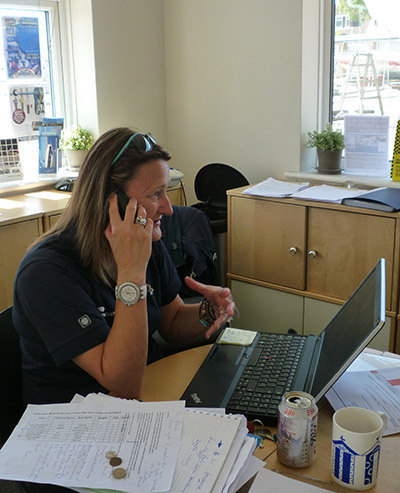 We have 7 assessors between Powerboat Training UK and Aquasafe Powerboat School so you may well know the assessor anyway. They are all hugely experienced at putting you at your ease and making the assessment straightforward and enjoyable. If you are undertaking the classroom course then you don’t need to do anything as we arrange the assessment for the end of each course. If you are undertaking the online course then just contact us when you have completed the online course and we will book you an examination. This will usually be at the end of one of our scheduled classroom courses. If there are two or more of you though we may be able to arrange a time/date just for you. What does the course and assessment cost? Each price quoted in the ‘Key Course Details’ section above is the price per head for 1 person, for 2 persons the per head cost reduces by 2.5% and for three people by 5%. The price shown is inclusive of VAT. The RYA fee is payable even if you are a RYA member. Can I take the assessment with you if I did the online course elsewhere? Yes! Just contact the office and they will schedule you in. This depends on how many people we are assessing. The written assessment will take about 20 minutes and the practical assessment will take between an hour and two hours. This means we expect a typical combined course/assessment to finish between 5pm and 6pm. What’s best – doing the course online or in the classroom? In all honesty if you can afford the time to come to us and do the course in the classroom in our opinion this is by far the best way. Whilst the online course is excellent what you really miss out on is the real hands on experience of our instructors who have many years of experience afloat and add to the syllabus to maximise the benefit of the course and your investment in it. Additionally, many people may find it easier to progress and pass the assessment, building on the time we spend using the radios during the day and the assistance the instructor provides as you progress through the course. However if you want to do the course away from the classroom then the online course is great. Equally if you already have the VHF licence and either need the DSC element or just want to brush up then its an excellent option. Don’t forget though that you will need to come into our classroom to take the examination. The RYA VHF/SRC course is aimed at everyone that goes afloat whether it is in a large Sunseeker, a family RIB or a small kayak. A VHF is an essential item of safety equipment and this course aims to give you the skills to be able to use it properly for routine and distress calling. New worldwide rule changes mean that some changes have been made to this course from the 1st Jan 2014. The course is now slightly longer and we send you a course pack ahead of the course – we can often get this to you very quickly. The big change though is that the course is now available online or in the classroom with the examination always in the classroom. During the course we give you plenty of opportunity to get used to what the various features of the radio do and using our scripted calls to get used to using the radio and becoming familiar with what you can use the radio for. You’ll find that the course we deliver creates an enjoyable day where you get the opportunity to learn lots and put it into practice on real radios. A really beneficial day. We have more training radios and training aids than almost all other schools. Indeed we actually hire out our kit to other schools for their courses. Sailing clubs, Police/Fire & Rescue organisations and other maritime organisations can book courses specific to them either at our bases in Poole/Lymington or at your own base for reduced rates. We have an exceptional range of kit for you to use. Whereas the RYA Training ratio requires one radio per three attendees we operate one radio for each attendee. The morning session will cover the practical operation of a standard marine VHF, channel usage, Distress/Urgency/Safety and routine voice procedures. In the afternoon we go onto look at the GMDSS scheme, equipment used in GMDSS i.e. EPIRBs, SARTS, Digital Selective Calling (DSC) NAVTEX, practical use of DSC equipment. The RYA VHF/Short Range Certificate course is not just essential for all small boat skippers and their regular crew members, there are plenty of others it’s relevant to…. Those with their own boats keen to ensure they are ‘legal’ but are also of course well versed in all of the means of issuing a distress message from their vessel. Whilst of course the distress element is a key factor knowing which channels to use and how to use the radio properly when out boating increases confidence and enjoyment. Those without a boat yet and keen to ensure they are acquiring the right qualifications either because they intend buying or for when they are chartering or hiring. The course is also a great way to enhance your knowledge about boating generally and helps when deciding what radios to buy. Those who have boated a while and are perhaps are already using their VHF but want to learn both how to use the radio to full effect and of course also to be legal. Kayakers and dinghy sailors are increasingly carrying personal hand held VHFs and are very sensible to do so. We have welcomed a good number of of kayakers and sailors to our courses – don’t let our company name put you off we love boating in all of its forms! Sailing clubs, Fire & Rescue Services, Police Forces, Military units and government bodies often ask us to come and train a group of their people in-house. As we have a portable kit including 8 radios plus examples of various EPIRBs, SARTs, PLBs etc so can ensure a really fun and informative course even if we are not running the course in our classroom. If you have a large group to train…. For yacht clubs and other organisations requiring group training we are happy to train in groups of twelve and are happy to travel throughout the UK. We have run in-house courses for various government, military and Fire & Rescue services during the last 12 months. To run a bespoke course at your location (in the Poole/Solent area) we will charge £300 + VAT giving a considerably discounted per head cost for the course. The RYA assessment fee is chargeable on a per head basis. We are happy to travel further afield for a small travel charge. A. THE GENERAL PRINCIPLES AND BASIC FEATURES OF THE MARITIME MOBILE SERVICE RELEVANT TO VESSELS NOT SUBJECT TO A COMPULSORY FIT UNDER THE SOLAS CONVENTION. A3. Elementary knowledge of radio frequencies and channels appropriate to the VHF maritime mobile band. – The concept of radio channel: simplex, semi-duplex and duplex. B. DETAILED WORKING KNOWLEDGE OF RADIO EQUIPMENT. 1.3 Portable two-way VHF radiotelephone apparatus. 1.3 Organisation of search and rescue. C3 Protection of distress frequencies. – The status of VHF Channel 70. 3.3 Prevention of unauthorised transmissions. 3.5 Avoidance of transmissions in the VHF guard bands. 3.6 Procedures to follow when a false alert has been transmitted. – Information contents of a distress alert. D1. Ability to exchange communications relevant to the safety of life at sea using the English language. LETTERS, I SAY AGAIN, I SPELL OUT, OVER, RADIO CHECK, READ BACK, RECEIVED, SAY AGAIN, STATION CALLING, TEXT, TRAFFIC, THIS IS, WAIT, WORD AFTER, WORD BEFORE, WRONG. 1.6 Use of international phonetic alphabet for letters and phonetic pronunciation of numerals. D2. Regulations, obligatory procedures and practices. – Preservation of the secrecy of correspondence. D3. Practical and theoretical knowledge of radiotelephone procedures. – Accounting Authority Identification Code (AAIC). The VHF course was excellent and I learned a lot. I had thought that, having chatted happily on the radio in aircraft all my life, I would know most of it but I didn’t stop taking notes all day. Keith was excellent. Thanks, as always. We came back because I remembered the professionalism. You exceeded the normal standards! I had Robin as my instructor on Friday at Aquasafe lymington. Very informative day and with a bit of fun thrown in. Great course and a good instructor! All 3 passed with flying colours !! Thanks to everyone down at Powerboat training for Saturdays Course, Shout out to Robin our instructor for the day for making sure we all passed. The course was made to be fun and very informative which made a long old day in class room go along a lot smoother.